The decorative sign outside the Terres De Biot pottery shop along the Rue du Marche in the Old Town of Nice in Provence, France in Europe. The design on the sign outside a pottery shop along the Rue du Marche in the Old Town of Nice in Provence, France is the logo and name for Terres De Biot, a special brand of pottery. Purplish blue colors on the lettering on the sign is the same as the flower symbols and is the trademark for this pottery.After entering the pottery shop in the Old Town of Nice, there are shelves stacked with a variety of different items. 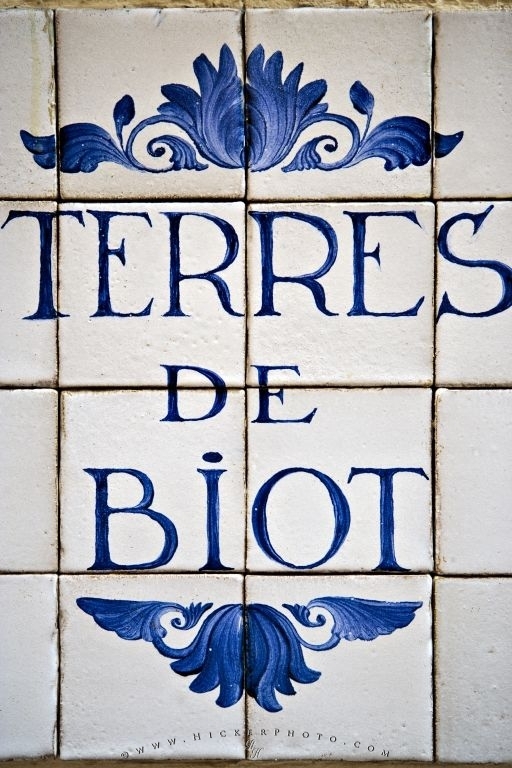 The pottery has been handmade by very talented people who reside in Biot where glass blowing is also a well known artwork created in this small town.Terres de Biot (pottery) shop sign along Rue du Marche, Old Town, Nice, Provence, Cote d'Azur, France, Europe.